I originally wanted to do the quilt using cheddar like the antique quilt that was an inspiration for this challenge, but I made a New Year’s Resolution to be a little more thrifty and knock down some of my stash. So… digging I went! I found this strange piece of light green swirly – circly fabric and I have no idea why I bought it, what it was originally for, but man, I had A LOT of it! What was I thinking? The photo is a little washed out by the background of my cutting board, but I still think this was a weird choice of fabrics for me. Still, why not get it out of my stash? And a scrappy bow tie quilt seemed like a good choice for this to become a background and really highlight some pretty fabrics. I have been working quite a bit with Civil War Reproduction fabrics and I decided to do something different and dig into my 1930s fat quarters. This has been fun. I have little mice and flowers and tea pots and Sunbonnet Sues and lambs and elephants and bunnies! I forgot all about these fabrics, but they are really showcased against this pale, pastel green and the reds and oranges in particular seem really bright and vibrant to me. As you can see, I’m about to have to dive back into my 1930s stash and cut some more small squares to use. Doing these bow tie blocks has really helped motivate me to finish the red string blocks for my Orca quilt though. Sometimes the string blocks seem to take forever to me (maybe it’s all the little pieces and the back and forth to the ironing board?) and while I love the string blocks and how they look in quilts, I was grateful to have something small and easy to accomplish while simultaneously working on those. I only have to make 16 more of these string blocks and then they will all be ready for cutting into the large triangles and adding the wing triangles to them. Yay! Note to self though – BE CAREFUL WHEN YOU CUT! Hmmm... there's something not quite right here. Oops. See how I cut vertically instead of horizontally across the stripes? Sigh. But easily fixed and moving right along. Have a wonderful day out there in blogland everyone! CUTE!! I went back and forth between 30′s fabrics and Civil War for my bow ties. 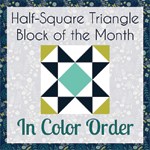 I went with CW but your blocks are making me want to do one in 30′s too!